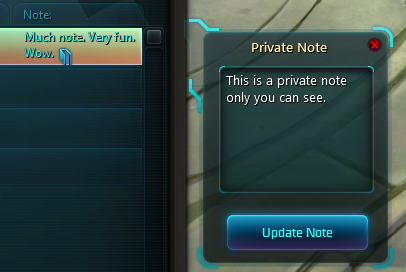 Wildstar allows private notes for friends, but not for guild members. This addon fixes that. You use it by selecting a member in the guild list. A new popup is shown where you can edit the note. To remove the note, just delete all text and update. Also if you hover over a member, private notes are shown in the tooltip. In addition a little icon is added to the note field to indicate that there's a private note available for a person.